Teksta is a life-like robotic puppy that responds to your voice, physical gestures, lights and sounds. 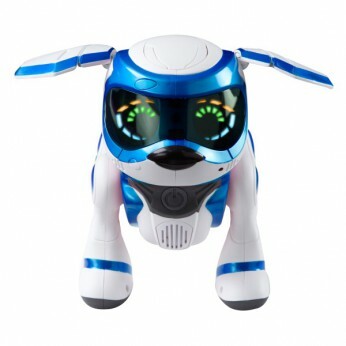 Engineered with state-of-the-art artificial intelligence, Tekstas’ toyetic interaction offers many emotions…barking, crying, whimpering, and expressive eye patterns to share his feelings. As your devoted companion, Teksta will fall asleep when the sun goes down and will wake up happy to greet you in the morning. Using cutting edge hand gesture technology, you can not only command Teksta to stop and sit but also teach him to perform his most spectacular trick of all, a back flip! With over 100 physical and app-sized interactive play features, Teksta will excite and inspire children of all ages. Bone and ball accessories included. For ages 5 and over.Requires 3 x LR44 (included) and 4 x AA (not included). This toy costs approximately £59.99 (for the latest and best prices make sure you check our retailer list for the Teksta Puppy Blue above). In our review of Teksta Puppy Blue we classed it as being suitable for ages 6 years, 7 years, 8 years but recommend you check the manufacturer specific advice before purchasing.